Loud beeping relay, suits classic vehicles & convertibles where the standard tick may not be heard causing indicators to be left on inadvertently. Reproduction of the Lucas SSB300 hazard switch assembly. Model type 155, part no 54006501, also marketed by Unipart as GSS159. Can be fitted under dash using bracket or discard bracket and direct install to dash. 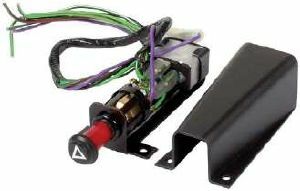 Useful for owners of classic vehicles without hazards who wish to intall a discreet and period hazard switch for improved safety. 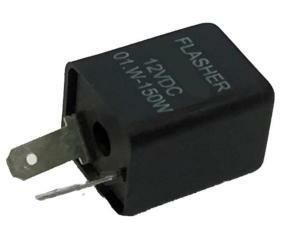 Suits all 12V positive or negative earth vehicles with existing indicators.